We cannot afford to lose any more time in developing a coordinated plan to make Dallas a more beautiful and effective city, for all around us the walls are rising, the city is being built… We are designing by default instead of summoning our vitality, wealth resources, talents and human vision to create a design plan that will give Dallas quality and character all its own. Which is why it’s so surprising that all traces of the film seem to have vanished in the intervening years. I contacted the Dallas Municipal Archives, the Texas/Dallas History & Archives Division of the Dallas Public Library, AIA Dallas, and Dallas Center for Architecture. Everyone was very helpful, but … nothing. Designs for Dallas and the later Goals for Dallas are better known projects, but it seems that there would be something connected with this film lying around somewhere. I’d love to see it. It sounds like it would be entertaining and informative … and depressing. We’ve come so far. …We haven’t come far at all. 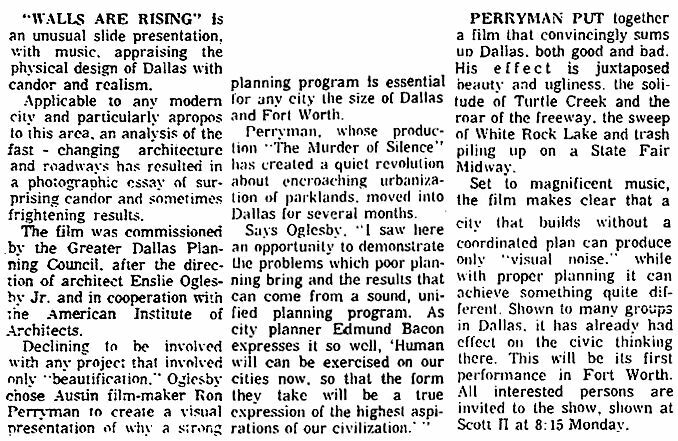 “The Walls Are Rising” was introduced to the Dallas public in Dorothie Erwin’s article, “A Design for Dallas Proposed,” which ran in the Feb. 12, 1967 edition of The Dallas Morning News. Additional descriptions of the film can be found in the article “A Courageous Look at Today’s City” by Larry Howell (DMN, May 3, 1968). UPDATE: Jan. 9, 2015 — Great news! AIA Dallas has found the film and has scheduled a screening! To read my follow-up post “‘The Walls Are Rising’ — FOUND!” click here. To read Robert Wilonsky’s Dallas Morning News article on the newly-found film, click here. For info on the AIA Dallas screening, click here. UPDATE: Jan. 20, 2015 — The public screening and panel discussion at the Sixth Floor Museum was great! Read about it here. UPDATE: May, 22, 2015 — AIA Dallas has digitized and uploaded the film to Vimeo. Watch the complete film here.